It is important to characterize the learning processes governing tobacco-seeking in order to understand how best to treat this behavior. Most drug learning theories have adopted a Pavlovian framework wherein the conditioned response is the main motivational process. We favor instead a hierarchical instrumental decision account, wherein expectations about the instrumental contingency between voluntary tobacco-seeking and the receipt of nicotine reward determines the probability of executing this behavior. To support this view, we review titration and nicotine discrimination research showing that internal signals for deprivation/satiation modulate expectations about the current incentive value of smoking, thereby modulating the propensity of this behavior. 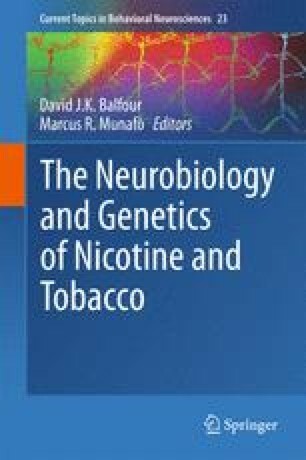 We also review research on cue-reactivity which has shown that external smoking cues modulate expectations about the probability of the tobacco-seeking response being effective, thereby modulating the propensity of this behavior. Economic decision theory is then considered to elucidate how expectations about the value and probability of response-nicotine contingency are integrated to form an overall utility estimate for that option for comparison with qualitatively different, nonsubstitute reinforcers, to determine response selection. As an applied test for this hierarchical instrumental decision framework, we consider how well it accounts for individual liability to smoking uptake and perseveration, pharmacotherapy, cue-extinction therapies, and plain packaging. We conclude that the hierarchical instrumental account is successful in reconciling this broad range of phenomenon precisely because it accepts that multiple diverse sources of internal and external information must be integrated to shape the decision to smoke. Funding: This work was supported by the MRC (G0701456: LH) and ESCR (RES-000-22-4365: LH); and by New Hampshire IDeA Network of Biological Research Excellence (NH-INBRE; NIH Grant Number 1P20RR030360-01 from the INBRE Program of the National Center for Research Resources: JRT).